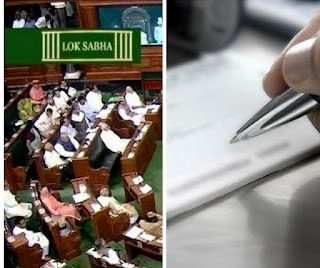 Government aims to reduce the burden of courts Lok Sabha has passed Negotiable Instruments (Amendment) Bill, 2017 to reduce the number of cheque dishonour cases pending in courts. It refers to any legal documents like cheques, promissory notes, bill of exchange etc which promises to pay bearer or holder of instrument or person whose name is written on instrument, specific amount of money either on demand or after specified time i.e. on some future date. The Bill inserts new Section 143 A in parent Act to allow the court trying the offence related to cheque bouncing, to direct drawer (person who writes cheque) to pay interim compensation to complainant. The Bill inserts another new Section 148-A in the parent act specifying that if drawer convicted in cheque bouncing case files appeal, the appellate court may direct him to deposit minimum of 20% of fine or compensation awarded by trial court during conviction. In case the drawer is acquitted during trial by appellate court, then court will direct complainant to return interim compensation (or deposit in case of an appeal case), along with interest. This amount will be repaid within 60 days of court’s order. Q. To reduce the number of which pending cases in courts has the Lok Sabha passed Negotiable Instruments (Amendment) Bill, 2017?